* This blog article refers to email productivity solutions for Microsoft Office Outlook 2003 or higher. If you think about it, when you’re composing an email there are two message parts that keep repeating: the introductory greeting message and your signature. Surprisingly enough, while there are many options available (built-in Outlook or 3rd party) to make your life easier and automatically add your signature to emails, there aren’t many options to choose from when it comes to handling email greetings. 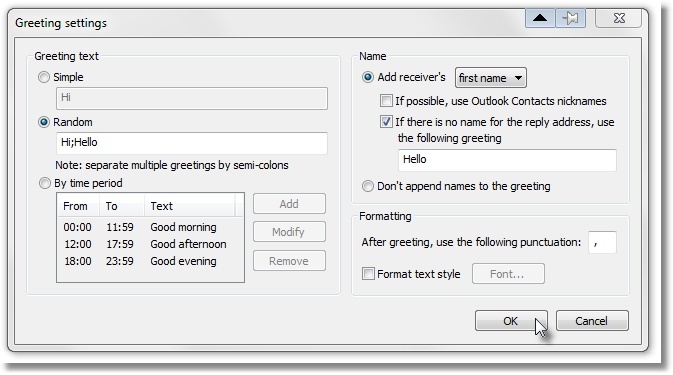 In fact, for Microsoft Outlook we are aware of only one such solution: the Bells & Whistles add-in for Outlook. Let’s imagine you’re composing an email using Outlook… it doesn’t matter if it’s a new message or a reply email because most of the times you’d start by typing a greeting text line: Hi John, Dear Mary, Good morning Emily, etc. Basically, you always repeat “Hi, Dear, Hello…” followed by the first/last name of the recipient. Every day for almost every single email! Plus, let’s face it: sometimes you have to answer emails from people that you aren’t very familiar with. And sometimes their names aren’t the most popular ones… So you have to spell their name and double check it, just in case so you don’t make a fool of yourself by giving new names to people. Using an automatic email greeting, the person’s name simply can’t be wrong as it’s copied directly from their email address alias name. So it’s not just faster, but also safer. After you defined your options in the above window, you’re done. When you will compose an email, the greeting text will “auto-magically” be inserted as the first email line without even having to press a button. It may not sound like a big time saver per email message, after all it’s just a greeting text line… but multiply it with the number of times you compose emails per day… Why would you waste your time typing the same greeting text over and over again? If you are a productivity freak or even if you just want to spend less time typing the same boring greeting text in your Outlook emails, this feature alone worth the $29.95 Bells & Whistles life-time license. Not to mention the other +20 productivity features that this Outlook add-in has to offer! You can download a free trial from here or you can go directly and purchase your license now (30 days money back guarantee!). great blog post giving tips on how to use some of the features in B&W.